Thirsk Castle was an example of a motte and bailey construction. This was a style brought to England by the Normans and was the simplest type of mediaeval castle. 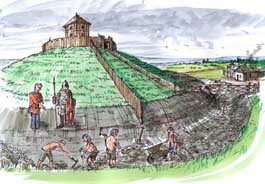 The motte was a conical mound of earth or rubble on which stood a timber tower. This stronghold could be surrounded with a ditch and a palisade. Around this stretched a level open space, the bailey, enclosed by a rampart formed by earth thrown up from a ditch on the outside; the rampart was in turn topped by a stout palisade. Castles like this were built in the early stages of the Norman Conquest as garrison forts in strategic positions; over six hundred examples have been recorded. Many later became aristocratic residences and administrative centres, the more permanent being rebuilt in stone. Thirsk Castle never developed beyond its initial stage and was demolished before the end of the 12th century. Nothing of the fabric of the castle is visible, but the late-Victorian Castle Villa stands in a prominent position on the remains of the motte. The western limit of the bailey is still marked by the impressive rampart which lies in front of you and the ditch where you are now standing. Over the centuries, and especially in more recent times, buildings have encroached upon the site. 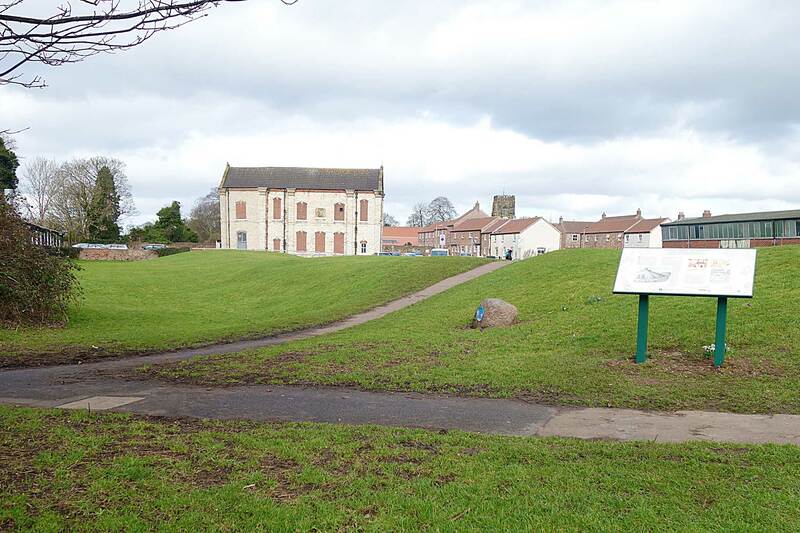 Castle Garth itself, however, has never been built on - it has served as garden or paddock down the years and is now adopted by Thirsk Town Council and preserved as an open space for the enjoyment of the community.